Lego Ninjago is based on the popular TV show featuring all the well know Lego mini-figures including Sensei Wu, Cole and Zane. Lego Ninjago is a must a have for every child aged between 7-11. Buy a single copy or subscription to Lego Ninjago comic. Keep up to date with Red Ninja Kai and his fellow ninjas as they use their powers for the greater good. 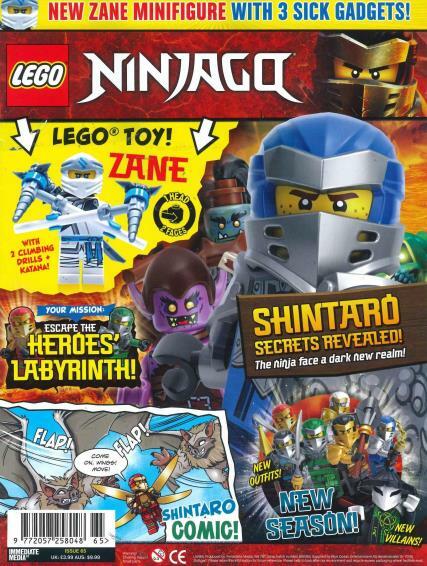 Every issue of Lego Ninjago magazine comes with an exclusive epic Lego minifigure. As well as featuring action-packed adventures and exclusive content that are not be missed. Inside each issue, there are several puzzles and activities to keep readers entertained until the next monthly magazine. Each magazine comes with lots of stickers and posters featuring the Ninjagos. Kids enjoy the legos and fun activities to do. Gift for grandchild, he looks forward to this dropping through the letterbox. Excellent. The kids love it. My nephew loves receiving this magazine! Grandson loves it especially the toy. My son loves it and awaits every issue! My 9 urea old grandson loves it. He reads it from cover to cover. My 6 yr old grandson loves it. Took a subscription to make sure he didn't miss any. Very funny, and the minifigure is always a good complement. My nephew is 7 and loves lego action. he likes the gifts and there is plenty of content he says he enjoys. Grandson loves this range, had previously had thomas tank engine etc. but has moved on now. WHAT NEXT!!!!! My six year old boy loves Ninjago,and the comic strips and activities and owrfectly suited to his age. He loves the games and is reading independently for fun. Ninjas and Lego! Both things my son loves.